5 development in developing countries. Major MLAs include the Asian Development Bank and African Development Bank. DFIs provide long-term development finance for private sector enterprises in developing countries. Examples include DEG (Germany) and FMO (Netherlands). 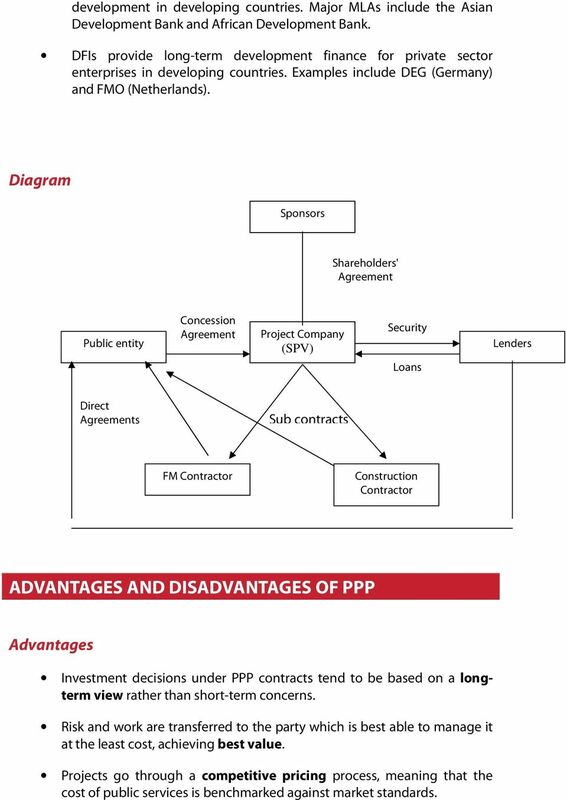 Diagram Sponsors Shareholders' Agreement Public entity Concession Agreement Project Company (SPV) Security Loans Lenders Direct Agreements Sub contracts FM Contractor Construction Contractor ADVANTAGES AND DISADVANTAGES OF PPP Advantages Investment decisions under PPP contracts tend to be based on a longterm view rather than short-term concerns. Risk and work are transferred to the party which is best able to manage it at the least cost, achieving best value. Projects go through a competitive pricing process, meaning that the cost of public services is benchmarked against market standards. 6 The timings and costings tend to be more certain and therefore deliver better value for money. 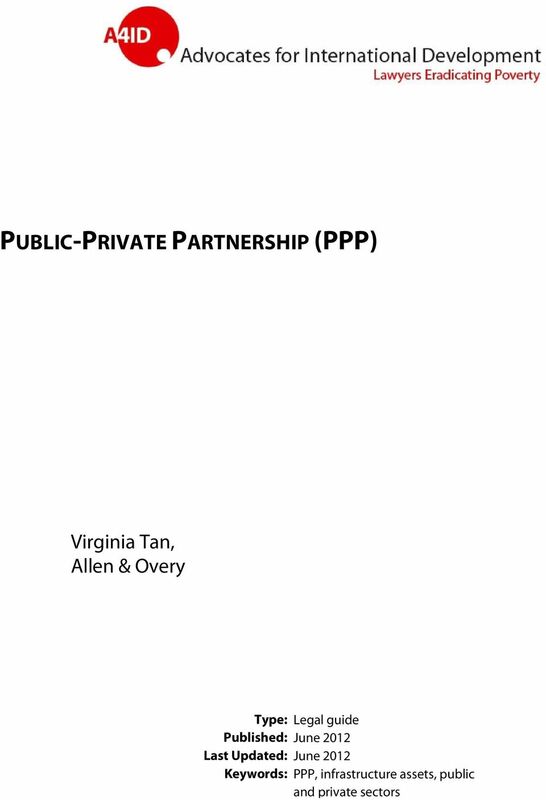 Where PPPs are not completed to budget, the private sector usually bears the costs. The cross-transfer of public and private sector skills, knowledge and expertise can create innovation and efficiency. The private sector often brings with it greater construction capacity, labour capacity and resources than would be available to the public sector. Payments to the private sector in PPP projects are usually linked to how they perform, creating incentives and efficiency. 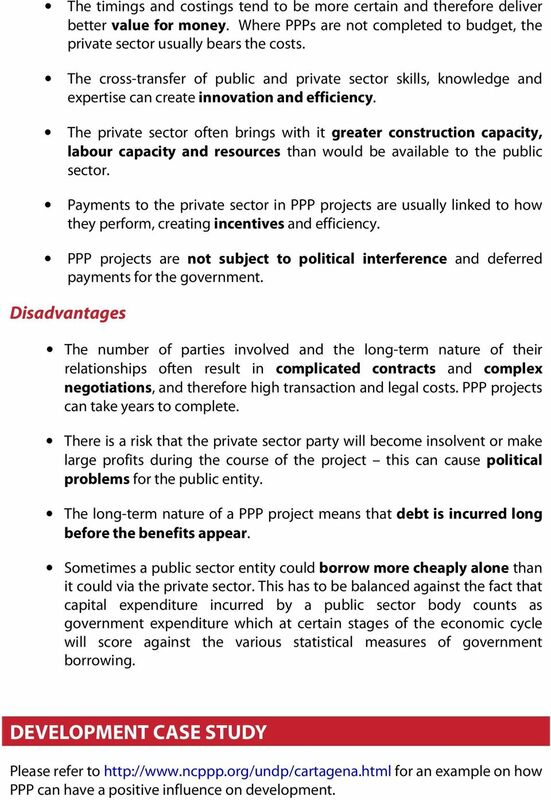 PPP projects are not subject to political interference and deferred payments for the government. Disadvantages The number of parties involved and the long-term nature of their relationships often result in complicated contracts and complex negotiations, and therefore high transaction and legal costs. PPP projects can take years to complete. There is a risk that the private sector party will become insolvent or make large profits during the course of the project this can cause political problems for the public entity. The long-term nature of a PPP project means that debt is incurred long before the benefits appear. Sometimes a public sector entity could borrow more cheaply alone than it could via the private sector. This has to be balanced against the fact that capital expenditure incurred by a public sector body counts as government expenditure which at certain stages of the economic cycle will score against the various statistical measures of government borrowing. 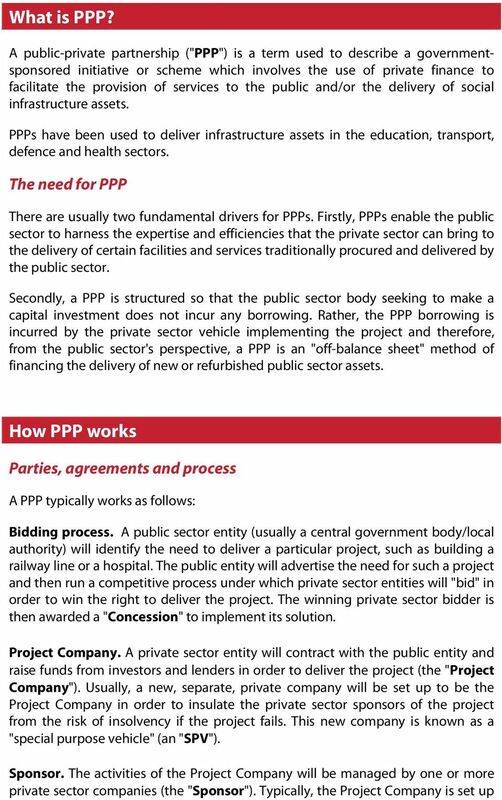 DEVELOPMENT CASE STUDY Please refer to for an example on how PPP can have a positive influence on development. Developing by Public Private Partnership (PPP): Meeting infrastructure needs successfully. Troubled Commercial Real Estate Debt Restructure 2010 Real Estate Conference June 17, 2010 Robert W. Reardon Partner, Real Estate and Commercial Lending Practices 404.504.7774 Charles R. Beaudrot, Jr.
PPP Models. Ownership of capital assets Responsibility for investment Assumption of risks, and Duration of contract. 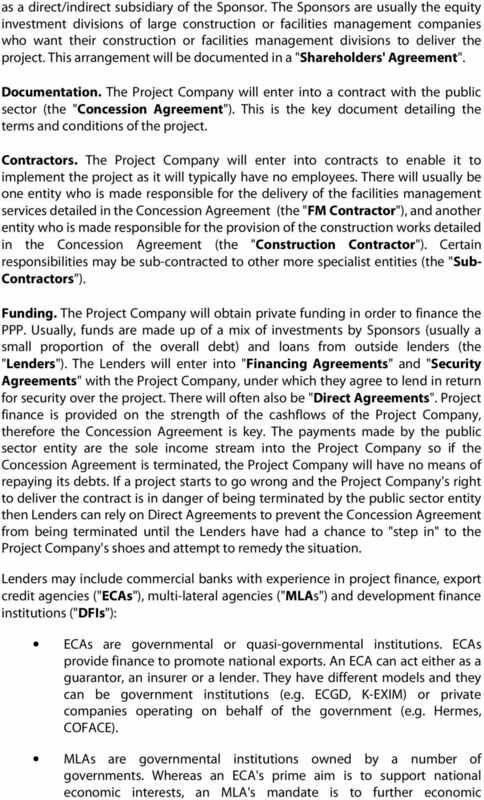 A P3 is Just Another Method to Finance and to Deliver a Public Works Project. Section A Introduction This section asks for information that aims to identify the independence and ownership situation of your business. Non Profit Social Financing. What do you need to know? Real Estate Related Assets: includes but is not limited to shares of real estate companies and higher rated real estate investment schemes.